Spring is here and for a lot of artists that means it is time for exciting new projects! Maybe you are looking to freshen things up around the house or in your canvas painting? Stencils are a fun, quick, and easy way to add pattern, color, and texture to a project. 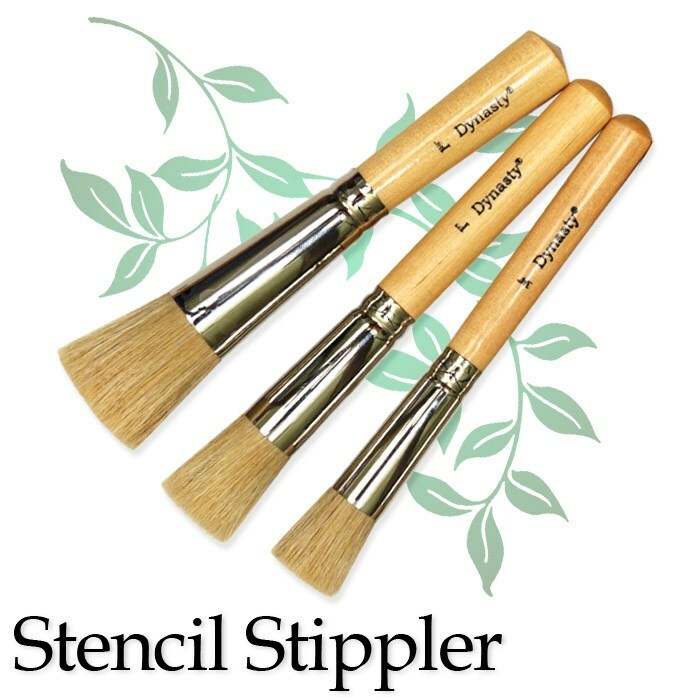 Dynasty Brush carries two type of stencil brushes: our standard Stencil brush and our Textured Stencil brush. 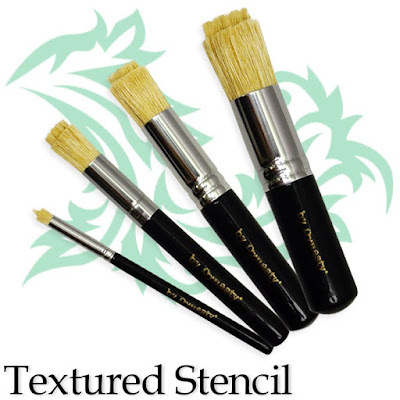 Both lines of brushes are crafted with quality white bristles and solid lacquered handles and can be used with both stencil paints and acrylic paints. There are two clear differences between the standard Stencil and the Textured Stencil brushes. One is obviously the color of the handles. This allows for easy identification. When you are in the moment, busy creating your masterpiece, you can easily reach for the right tool based on color. The second difference is the configuration of the bristles. 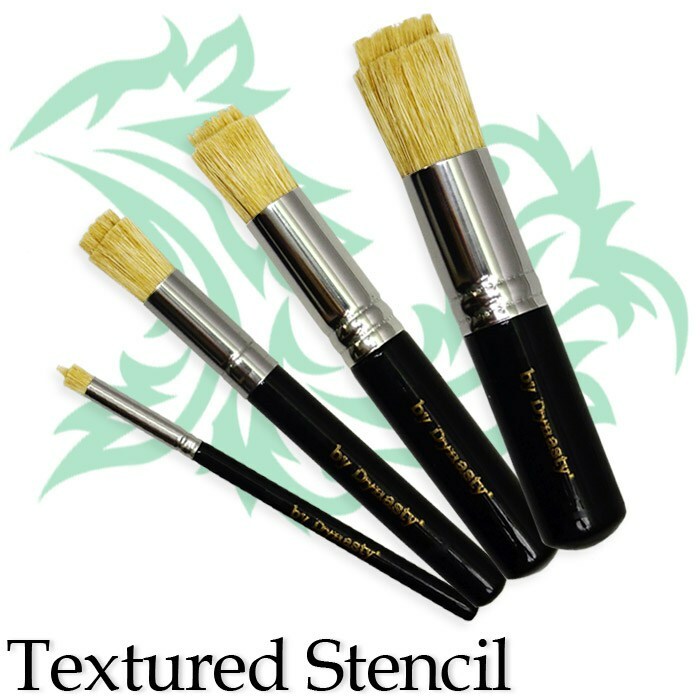 The Textured Stencil line has a patented two tier bristle shape which helps contain color inside the stencil space. If you are a crafter, a decorative artist, a mixed media artist, a scenic artist, or an artist looking for new ways to incorporate text or patterns into your work, these brushes would be a fine addition to your studio. Want to know where you can find Dynasty brushes near you? Click here! Come see us in Daytona for Oceans of Color! Dynasty Brush, along with our parent company FM Brush, is excited to be part of Oceans of Color: the 45th annual international conference and expo of the Society of Decorative Painters. This year's conference takes place May 16 through May 20 in Daytona Beach, Florida at the Ocean Center. Register for this year's event here. FM Brush will be located at booth 411 on the Expo Floor and will feature demonstrations by Dynasty Artists Deb Antonick, Jill Fitzhenry, Tracy Moreau, and Sandy Warner McTier. Conference artist Judy Westegaard-Jenkins will be teaching on opening day of the conference from 2:00 to 8:00pm. Dynasty's own Tracy Weinzapfel will be teaching at the Dare 2 Create event on Thursday, May 18 along with artist Andy Skinner. So join us in Florida for some sun and painting fun! You won't want to miss this!